Acquired directly from the artist by the great-grandmother of the present owner, and thence by descent. Fanny Guillon-Laffaille will include this painting in her forthcoming second supplement to the Dufy catalogue raisonné. 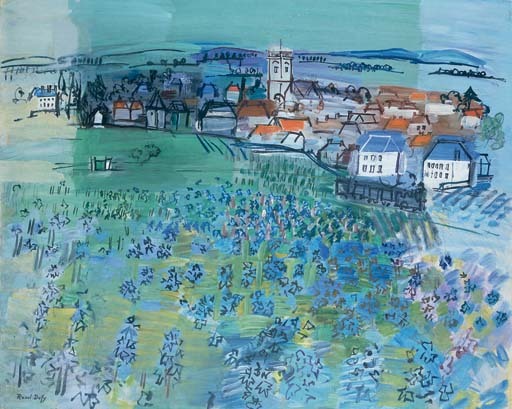 In the 1930s, Raoul Dufy travelled extensively throughout France. Paysage de Bourgogne, dating from 1936, is an exuberant celebration of the Burgundy landscape, famous as a wine-producing region. One of Dufy'’s cherished themes, the French countrysie was a constant source of inspiration, which he often depicted during harvest season. In the present work, he has chosen early Summer, the vine-leaves abundant on the stakes in the foreground of this lush countryside. 'Dufy's own special feeling for luxury is inherent in his approach to nature. The love for each blade and every insect, each flower, and every delightful prospect of tree and glade …comes from an attitude thatisi wholly French in its curious balance between worldliness and a calm, quite unstrident sophistication which civilises nature, farms it, tills it, shapes it and caresses it with a profound respect' (B. Robertson in exh. cat., Raoul Dufy, 1877-1953, Arts Council, London, 1983, p. 23). Expressive, dynamic lines describe the forms of the village church and houses, the passing train, the contours of the hills and vines. These strident black lines serve to accentuate the bright colours of the forms, yet do not attempt to contain them. The vivid greens, blues, and reds are applied in strong rapid brushstrokes, and overflow into the surrounding space, as Dufy pays homage to the freedom of nature itself. Dufy confidently resolves the question of representation, dispensing with detail to emphatically emphasize colour and light. 'C'est l'harmonie et la distribution des lumières-couleurs qui font la composition et l'’harmonie en ne donnant pas une couleur locale à la lumière puisqu'’elle est la réunion de toutes les coulers théoriques: c'’est là que ma pratique de la couleur-lumigere rejoint le système de la théorie des couleurs.' (R. Dufy in exh. cat., Raoul Dufy, Fondation Pierre Gianadda, Martigny, 1997, p.